Horseshoe Acres is a private equestrian community that spans 190-acres of paradise complete with multiple sparkling lakes, lush tropical landscape, and colorful plantings. This sophisticated community features charming trails throughout the property for horseback riding and boasts a relaxed country atmosphere just minutes away from the heart of Boca Raton. Quaint winding streets are laced throughout the community, with charming street names such as Bridle Path, Stagecoach Lane, Horseshoe Lane, Surrey Lane, and Wagonwheel Drive. Living in Horseshoe Acres has tremendous benefits; for instance, if residents want to take advantage of raising crops, animals, or trees, they can benefit from a dual residential and agricultural tax base. 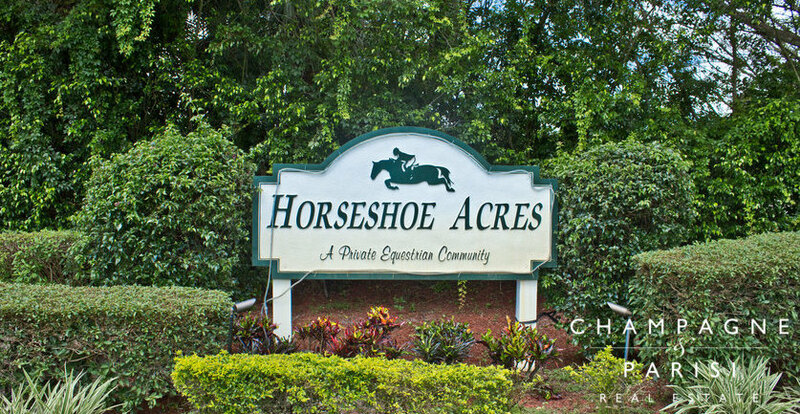 Additionally, Horseshoe Acres is one of the only communities approved for raising and housing horses over expansive and lush lots. Horseshoe Acres is also close to major area highways including Florida's Turnpike and I-95, making it convenient for residents to take a quick trip to one of the neighboring South Florida cities or the nearby international airports. This affluent community is zoned for some of Boca Raton's A-rated public schools including Sunrise Park Elementary, Eagles Landing Middle School, and Olympic Heights Community High School. If you would like to learn more about Horseshoe Acres or any other gated communities in Boca Raton, FL, please call us at 561-998-9015. You may also reach us by completing the brief online contact form provided below and one of our luxury real estate specialists will reach out to personally assist you. We at Champagne & Parisi Real Estate are committed to providing a positive home buying experience for each of our clients and look forward to having the opportunity to assist you in finding your Boca Raton dream home! Click the following link to view all single-family homes for sale in Boca Raton, FL.